This post contains affiliate links. If you purchase items using these links, About a Mom earns a small commission. St. Patrick’s Day is just around the corner! I think it’s time to share another fun St. Patrick’s Day dessert. 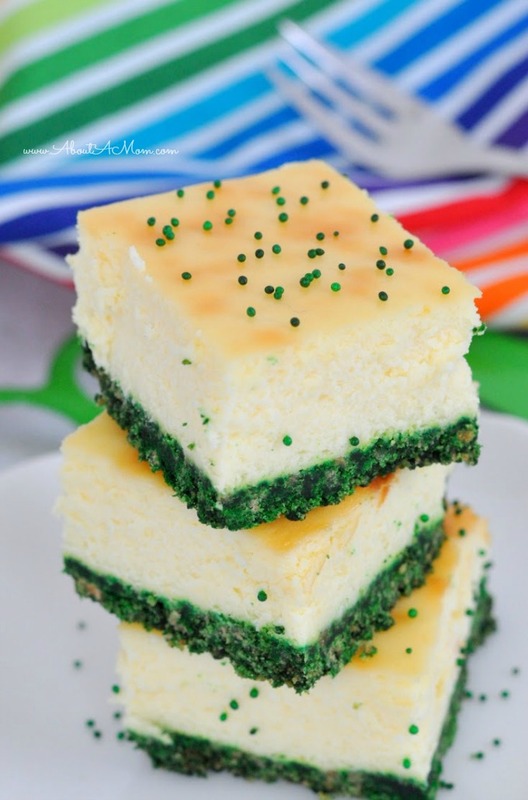 These Green Velvet Cheesecake Bars have just the right amount of green to be festive. You might also like Lucky Charms Popcorn and Green Tea Shamrock Cookies! 1 oz green food coloring. Tip: I like the way gel food coloring works. It takes less dye and it doesn’t make everything as wet. green sprinkles Tip: I find that it is hard for me to find just green sprinkles at my store. It is easier for me to purchase them online. Or these little shamrock sprinkles are adorable. Tip: If you use parchment paper, the dessert is easier to remove from the pan. I use it for a lot of my desserts, but it can be hard to find at the store. Here is another option to get parchment paper conveniently. 1) Preheat oven to 350 degrees. Line a 9×9 baking pan with parchment paper. 2) In a large bowl, combine graham cracker crumbs, butter and green food coloring. Stir well to combine. Press into the bottom of prepared baking pan. 3) Beat together cream cheese and sugar. Add eggs, one a time and mix well. Stir in vanilla extract. Pour cream cheese mixture on top of crust. 4) Bake in preheated oven for 40 minutes or until center is set. Cool for 15 minutes and then transfer to the refrigerator to cool completely before slicing. Top with green sprinkles. 1 oz green food coloring. 1) Preheat oven to 350 degrees. Line a 9x9 baking pan with parchment paper. I NEED this in my life! Perfect for a holiday family gathering. Those look so amazing. Seriously! Cheesecake is my fave! This is amazing, I love the colors and it looks so yummy; I will have to try this! I love the idea of green velvet for St. Patrick’s Day! They look yummy! 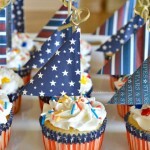 These look awesome and so festive! I really love how these look and I bet they taste great too! Those are so tempting! I think they’re great for the holiday tomorrow! These are so cute, my family would really like to have these. Wow these look so good! I’ve had red velvet every year for my Birthday and I am Irish so it’s time to try this! What a perfect dessert for Saint Patrick’s Day. These look good (and are pretty). Even though St. Pat’s Day has passed, I think they’d be great for Easter. These Look Delicious! Super Creative! 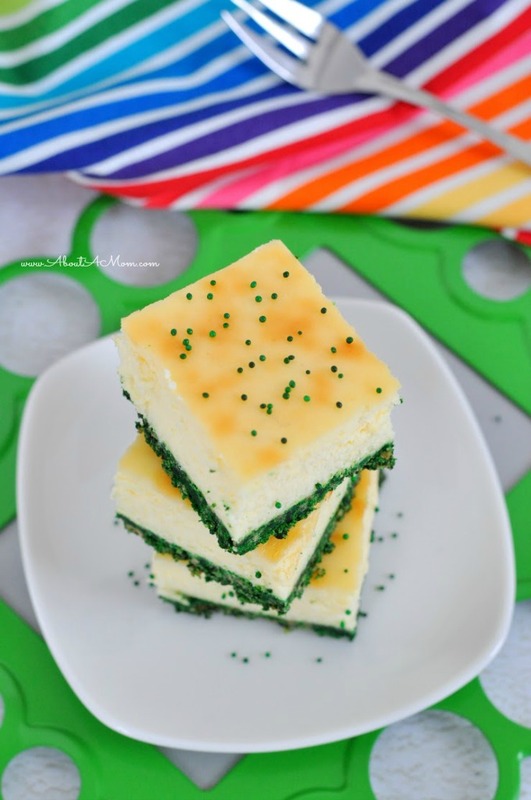 I love Cheesecake bars, and these look so delicious and fun to make. I like the green crust-it gives it a nice color. I bet you could make these with different colors of crust for different Holidays! 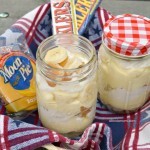 Omg I have to make this! I love cheesecake and this just looks so delicious. It’s a great St. Patrick’s Day dessert. These really caught my eye, they look so festive and also springy, too. I’d love to try this! I love this recipe. We will be making these for St. Patrick’s Day. I just love cheesecake, even if it’s green. These look so yummy and fun for the season thanks for sharing this one. These cheesecake bars look divine, I am definitely going to be making these, love cheesecake! I’m a HUGE cheesecake lover so this recipe is awesome’ I’ve NEVER heard of such…even after years of online hunting! PS…I love Shamrocks too! This is a great idea! We love cheese cake so I think I am going to make these. Can Stevie be used in place of the regular sugar? Hi Tracy! I don’t really have any experience using Stevia in my baking, so I can’t really say. Can you make these in a 9×13 pan?? I haven’t, but, yes, I think that would be fine. Hi Angela. Have you made these without the chocolate graham cracker crumbs? I have a non-chocolate person in my family. Thanks! Hi Tracy! I have not, but I think regular grahams would be just fine. This looks so delicious. I love cheesecake. Mine didn’t turn green, they stayed brown from the chocolate 🙁 Maybe just regular gram-crackers next time so they absorb the color.